I have used Lajet until now, but I change to a long T-type wrench and use it. Work efficiency has improved considerably. This review is about item#75263072. Since the console box lid was damaged, it was purchased as a tool for replacement, and exchange was completed without delay. This review is about item#75263115. I wrote a long type wrench on the product page, but how many centimeters is it actually? I was anxious because it did not understand but it was long enough. (About 15 cm) It is easy to use. This review is about item#75263081. Because satin finish processing is rough, I feel caught in a glove glove. I rubbed the surface lightly with paper and it became moderately rough. It is a thoroughly satisfying thing if you choose by focusing on COSPA because you can not see the top. I bought a head angle of 10 mm. It is OK even if the handle part is a little short, and the longer the wrench length, the more useful it is. Because it is low cost, I can use it without hesitation. Accuracy is good without licking. Work in narrow and deep place. T type wrench, if you can replace the socket is the best! 6.3 mm or 9.5 mm socket available T type wrench. I bought it because the drain bolt of YAMAHA's 50cc scooter was 12mm and I wanted a long wrench for my neck. Easy to use and convenient. This review is about item#75263097. 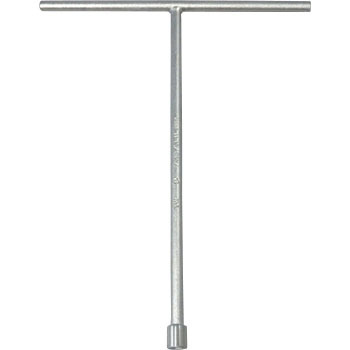 T type wrench has not used much, so purchase what kind. In normal use there is no problem first. But it is 6 points, it is not a face contact, the wall thickness is not as thin as a famous manufacturer's socket wrench, and the shaft is satin finish so it feels like when it is fast turning · · · There is a margin for money If you are looking for quality, I think that it was better for you to ask for the mirror finished goods of famous manufacturers obediently.